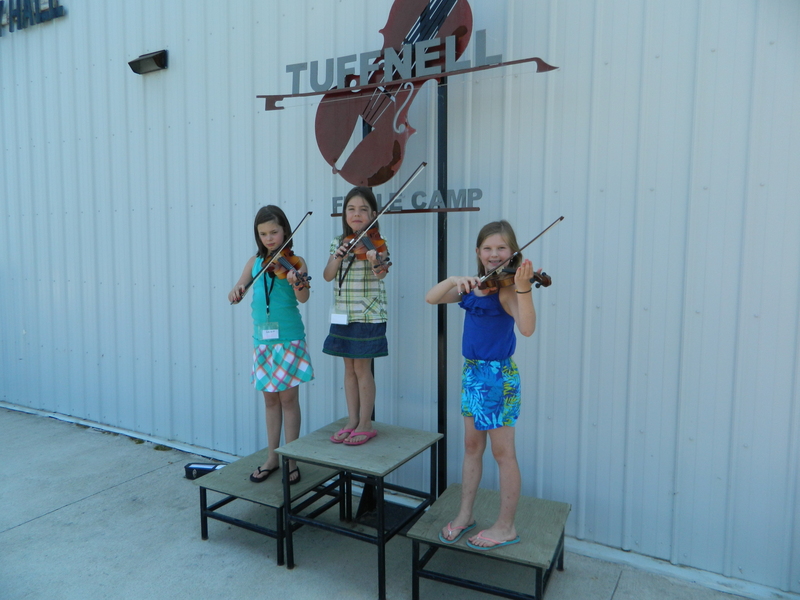 The final rehearsal at Shivering Strings–a music camp for fiddle, banjo, guitar, and keyboard players. I lean across the table and ask the lady with the arched eyebrows my question for the third time. I want to know how she does it, or rather, how she makes her daughter do it. If this mom is taken aback by my interrogation she doesn’t show it. 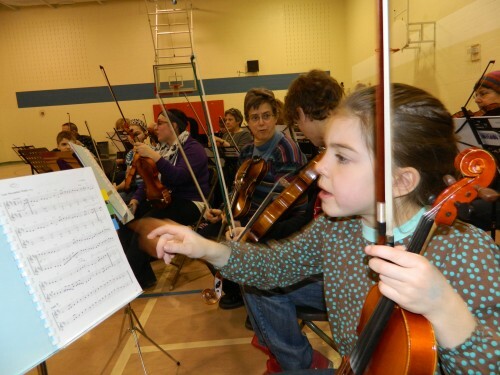 I think she senses my fascination and that I’m truly curious how anyone manages to get a 10-year-old to practise violin for two hours a day–on top of competitive dance, voice lessons, and musical theatre. Belén working up calluses with those pesky bar chords! She explains how they practise an hour in the morning (she plays along with her daughter during every practise) and another hour in the evening. On weekends they play for three hours, or more, per day. When she sees my mouth hanging open she gives me more details. I must be wide-eyed, still, because she tries again with a smile. I’ve not read the book–reading about the book was enough for me–but I appreciate her willingness to offer artifacts from her culture to help me understand where she’s coming from. “When do you sleep?” I ask now, steering my attention to the girl. I might’ve asked about play (as in toys, trees and neighbourhood kids) but I’d heard enough to know it wasn’t in the week-day schedule. 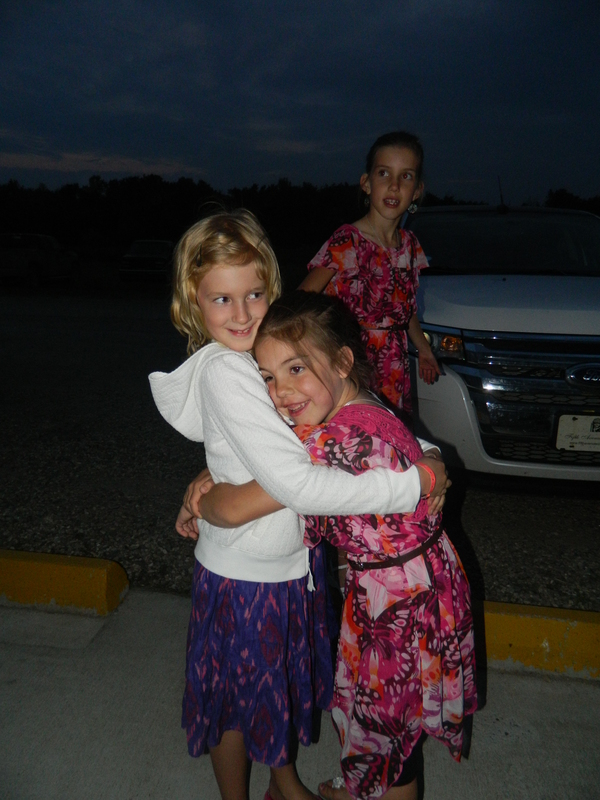 “I go to bed around 9:30 or 10,” she answers, which leads to my next question about homeschooling. Perhaps I’ve found their secret; they must slave away every evening only to sleep in and watch cartoons before a late-morning practise! I quickly learn they don’t watch TV and that she attends a French Immersion school (where all content area is taught in French–one more thing for her to learn.) As we continue visiting I’m beginning to realize there might not be any secret to discover. 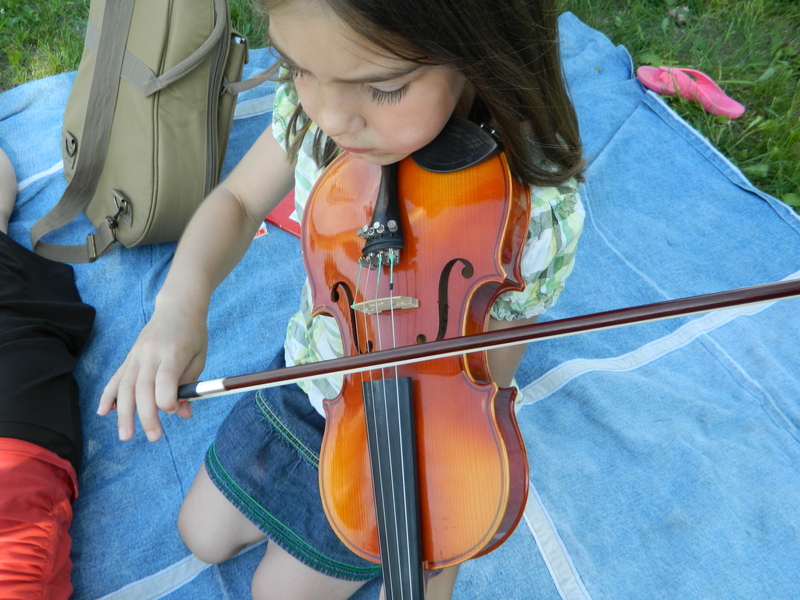 If she wants to be a serious violinist when she grows up, as she claims, she needs to spend her childhood practising. If this beautiful mother, who wants so much more for her child than she ever had, intends to push her daughter through the easy inlet of average and on to the spawning grounds of excellence, she needs to insist on structure and discipline. Just as salmon leap onward against the current, neither mother, nor daughter, can afford any backward glances at the lowlands. I feel like an ethnographer interviewing someone from a foreign tribe and I’m trying to memorize everything she says so I can report it all to Stan. Later on, when I repeat the conversation I’ll hesitate for a moment, not sure I want to offer him free fuel for his argument against mediocrity. Because while I have my feet firmly planted on middle-ground, Stan is skeptical of my enthusiasm for being unexceptional. Of course, this also plays into our expectations for our own children and how we parent. While I wax poetic about being well-rounded, happy, healthy, and socially apt, Stan points out examples of people who capitalize on their capabilities through sweat and tears, to inspire us to reach higher. 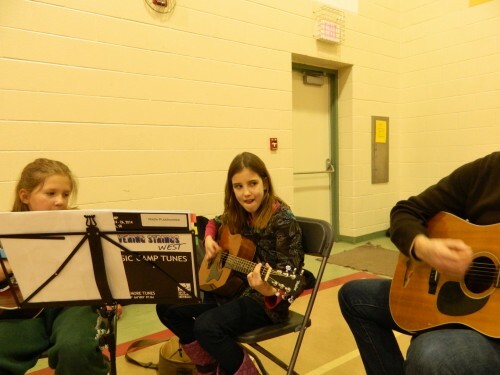 Stan has never taken guitar lessons, so this was his first chance to learn along with his daughter in a slightly more formal setting than our living room. Susanna and I were in the same class. 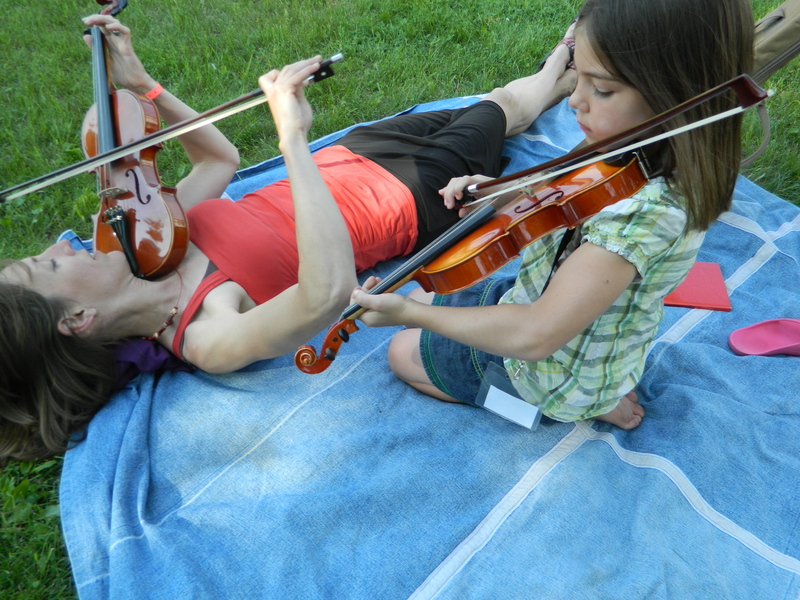 Although she is much better at playing by ear, I can read music, so together we made a good team. My favourite part of the American radio show, Prairie Home Companion, is the line Garrison Keillor uses to describe Lake Wobegone, “where all the woman are strong, all the men are good-looking, and all the children are above average.” Come on, admit it… didn’t we all want to be strong, good-looking, and above average–before we we realized we probably couldn’t pull it off? And then, wasn’t it easy to hope that perhaps those fleshy little lumps, carrying bits and pieces of ourselves and even our last names, could do better than we did? After meeting beautiful-tiger-mamma, I’ve changed a bit this week. I’ve mandated longer practises (the actual play time is now equal to the portion of the practise spent going to the bathroom, tuning, rosining the bow, adjusting the music stand, etc). I’ve been pickier. I’ve yelled more. And honestly, it’s been a drag. Through it all, I’ve also thought about Lucy. (If you’re new here, she’s my one-year old niece who’s been battling cancer for 5 months). And after all those tears, prayers, fevers and waves of hopelessness, she’s still here! As she fought her way through her last round of chemo with smiles and new sets of eyelashes, I had this wild yell building up inside that I couldn’t wait to shout: “SHE’S GONNA LIVE! Thank you Jesus!” Do I care if she becomes an accomplished musician? Does it matter if she’ll ever shoot a three-pointer? (Well, maybe to her dad. :)) Does she have to “make something of herself” to make her recovery worthwhile? No. Her life is precious because she’s got it. And the crazy thing is, our children have the same gift she’s been given. It’s hard to remember when I’m pushing, negotiating, demanding and cajoling, but it’s true. They’re here! They’re alive and well! Their lives are worthwhile whether they can play perfectly on tune, or not. …But, I’m still going to wake them for an early-morning practise tomorrow. They can thank tiger-mamma for that one. PS. I never got to explaining the pictures very well, did I? 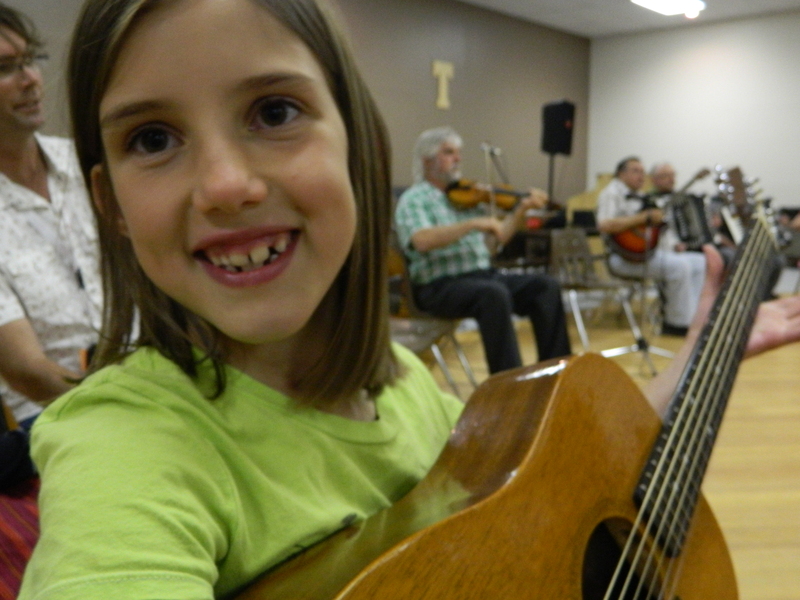 They were taken last weekend at a 2-day music camp in Saskatoon which included a dance, concert, and hours of old-time, Cajun, Quebecois and Metis music. 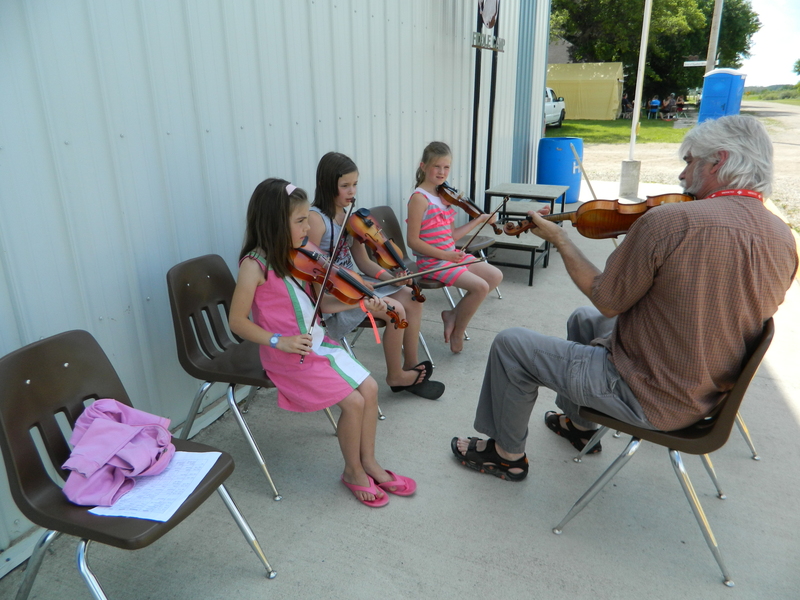 What do energy consumption, a school classroom, and fiddle camp have in common? Isn’t it weird when you hear the same message from several different sources? Like when every book you read seems to point to a similar truth, or random people talk to you about a certain issue. Lately it’s been that way for me as I learn about the power people have over other people–otherwise known as community. 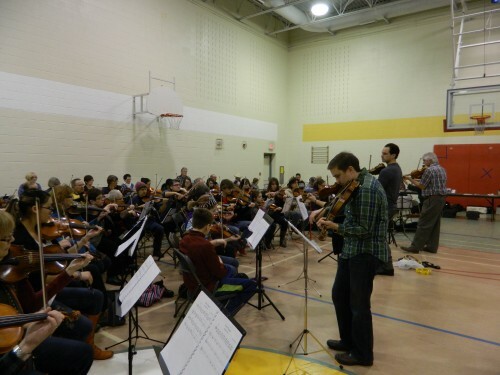 In the last month, I’ve heard the same message from a behavioural scientist, an elementary school teacher, and a fiddle intsructor: positive change and growth happens with other people. I guess it’s not that earth shattering–I learned about peer pressure in junior high health class and we know, intuitively, that humans are social creatures–but it still fascinates me. Alex Laskey shares (on TEDtalks) about the best way to encourage homeowners to consume less energy. He’s found that residents don’t respond to moral pleas (help save our planet) or even financial incentives (energy efficient fixtures save you money). What really works is social pressure; letting people know how much energy they use compared to their neighbours. Once people find out the Jones’ energy bill is a fraction of their own, only then are they motivated to make lifestyle changes. Belén, at a the nightly circle jam where 80 musicians sat in a big circle and played/improvised the same tune. 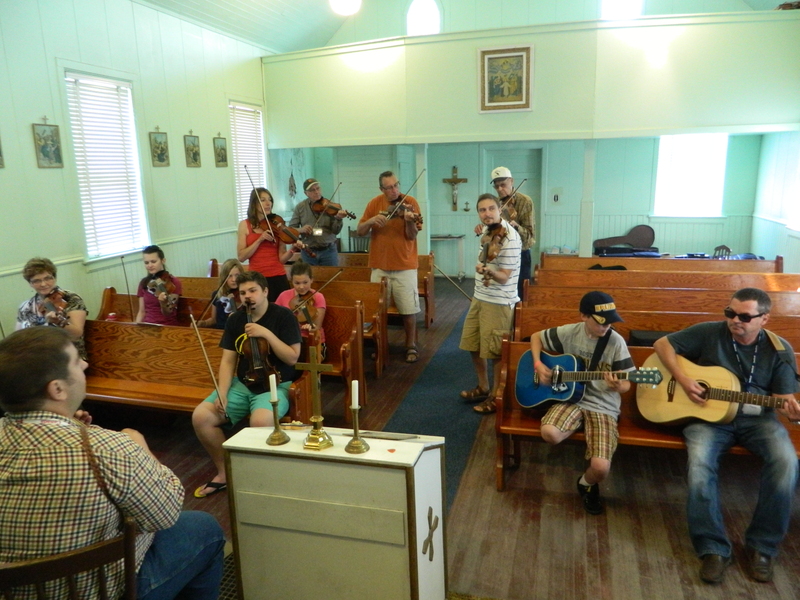 Instruction in fiddle, guitar, mandolin, banjo and keyboard was offered during the day. During the last month of school I visited my friend’s fifth grade classroom to observe how she motivates her students. The moment I stepped through the doorway I recognized one of her top priorities: to foster a community of readers. There were couches, chairs, even a fireplace! and baskets of books everywhere. When it was time for individual reading the students scuttled away with their books like cockroaches, trying to find a corner to settle into. Later, my friend gathered the students into a circle to talk about what they’d been reading and make recommendations for the summer. From the tone of their voices I might have thought they were discussing their summer plans or a vacation at Disneyland, when they were actually suggesting the next title their friends should get their hands on. The atmosphere in the classroom didn’t happen overnight, and it wasn’t a random phenomenon. My teacher friend is passionate about turning ho-hum readers into voracious consumers of literature, and she does this through community; intentionally making her classroom a place where every student ups the ante, talking about the books they love and hate. By the end of the year they all experience the explosive nature of community… and they’ve all read more books than they would’ve imagined possible. This was after a day of workshops. I was really tired and intended to take a nap, but then Susanna started playing “Pelican Reel” and I had to pick up my fiddle to learn it. 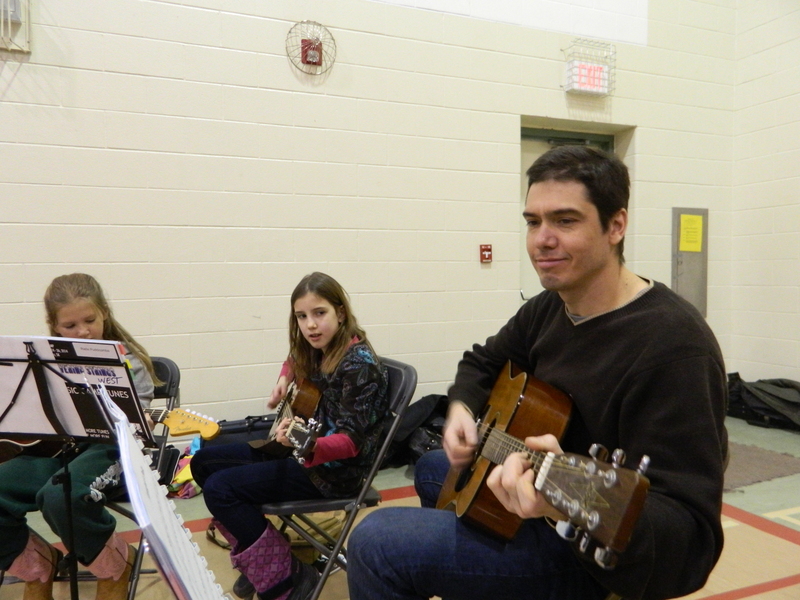 As you can tell from the pictures, we were making music last week… in community. 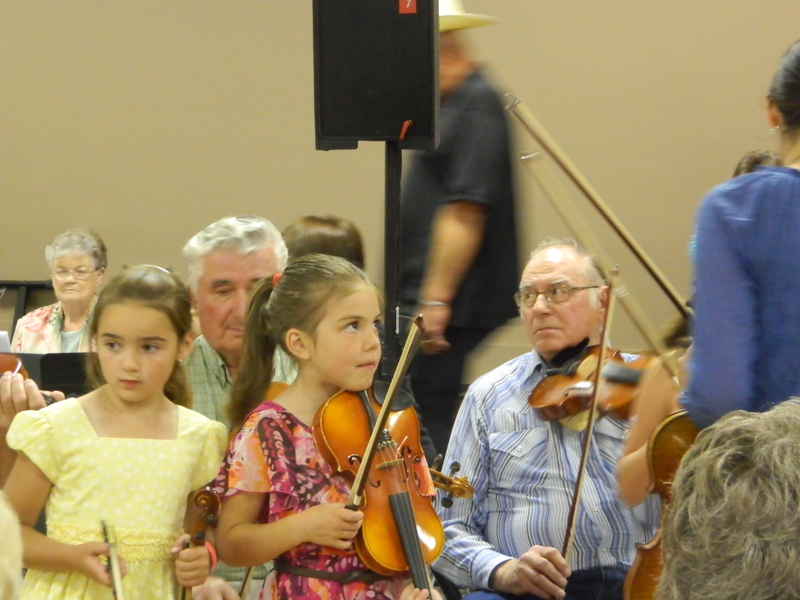 I heard Susanna’s instructor, Gordon Stobbe, comment, “The fiddle is a social instrument… you don’t play it alone in your basement to get better. It comes alive with other instruments.” And after a week of playing with other people, I think he’s right. 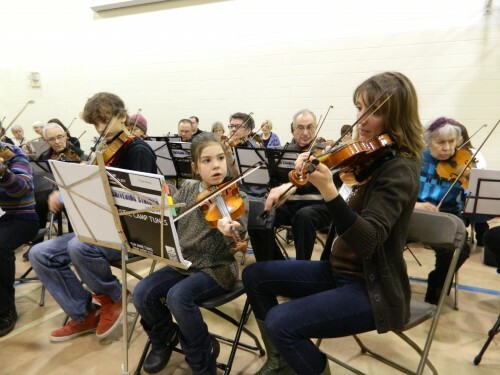 In four days we learned more tunes and technique than months of weekly lessons/practise. Susanna’s class. They had Gordon Stobbe all to themselves for the week! 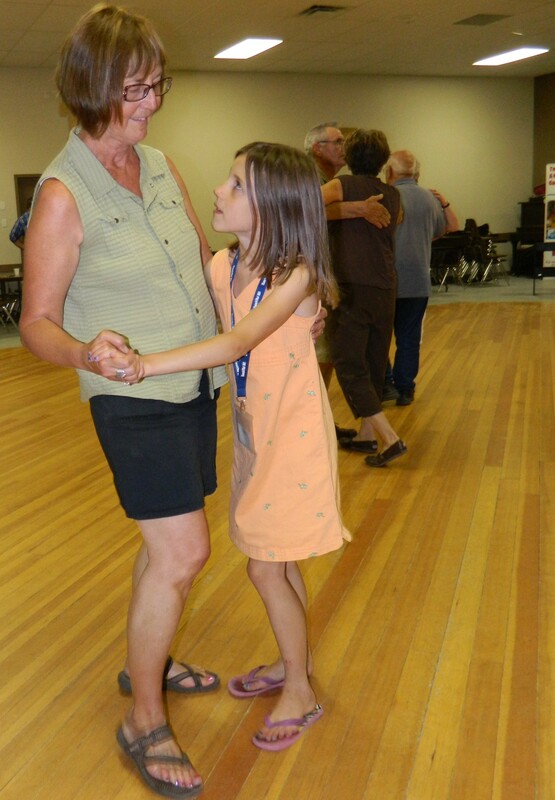 Most evenings there were square dances and also old-time dances. There’s something about do-si-doing with teenagers and octogenarians that makes the world seem like a better place. My mom came along for part of the week. She didn’t take any classes but joined in on the dancing, food, and concerts. 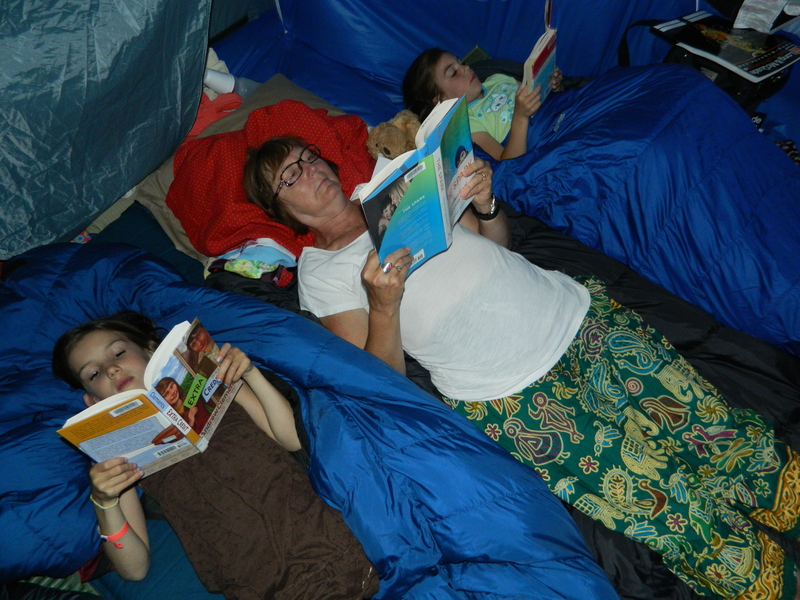 … she also joined us in our cozy tent. 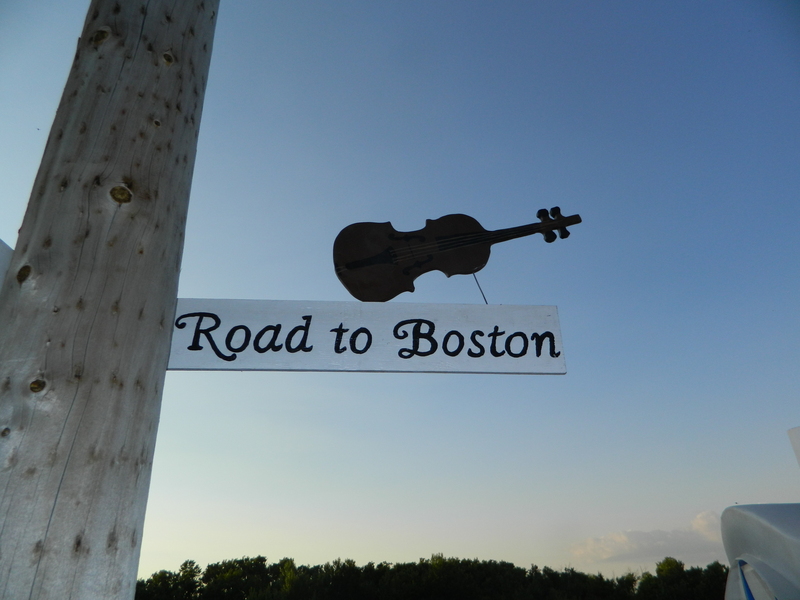 Street signs around town are named after popular fiddle tunes. One of the best resources for tapping into growth and transformation is all around us: the people we connect with. 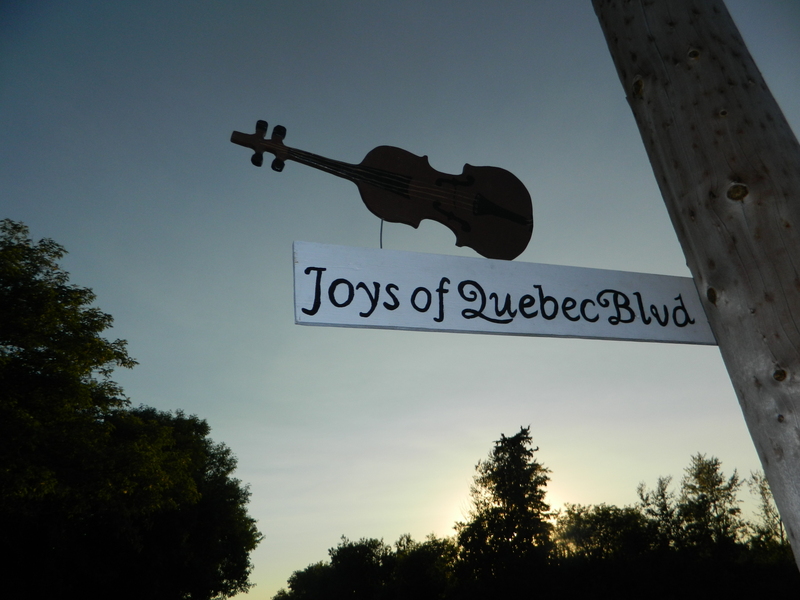 They can reduce our energy consumption, turn us into readers and make our fiddles sing! 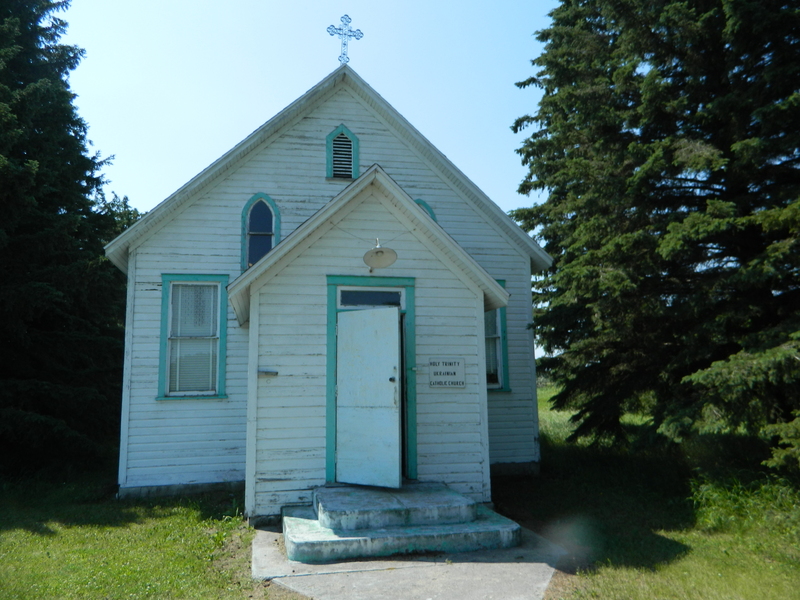 I was first introduced to Richard Thompson’s music in a dingy cabin that smelled of fish and smoke, on the shores of Great Slave Lake, N.W.T. It was the summer of 1997 and Thompson, a British singer/songwriter, had been recording music for over 25 years by that point, but I had never heard of him. Here is a ballad with good harmonies he wrote and sang with his wife, from the album Pour Down Like Silver (1975). You can hear it here. I recommend you listen to it when you are not rushed. It is slow… slow… slow–and beautiful; something that goes with candles and a glass of wine or a cup of tea. He also sings it with Bonie Raitt, and I like their version just as well. It’s a little more throaty. You can watch, and listen to them here. *My own end of the week tradition: words in song or story that move me in some way. I might type my very favourite parts in bold text, and I’ll always try to post a link, or two, so you can get more if you want it. Enjoy! This week* the words come from a song by Scott Cook, a traveling musician from Edmonton who performed at our local coffee shop recently. Watch him sing it here or go to his site. *My own end of the week tradition: words in song or story that move me in some way. I might type my very favourite parts in bold text, and I’ll always try to post a link below the quote so you can get more if you want it. The photos in these posts (and only these posts) may not be mine either but the source will appear if you move the mouse over the picture. Enjoy!